Morley has announced that they will be releasing Morley Instrument cables and guitar & bass strings. Boredbrain Music has announced that its Patchulator 8000 8-channel mini patchbay is now available. Iconic Sound announces the availability of their patented LightLead, the first audio analog optical jack cable for music instruments. Adam Hall is taking advantage of the new Rolling Stones tour to unveil its new Signature audio cables for microphone and instrument. Gibson will launch in May the Memory Cable, a first-of-its-kind audio cable with built-in recorder designed by Tascam. Iconic Sound, new British company, will introduce at NAMM 2014 a new optical analog guitar cable called The Light Lead. 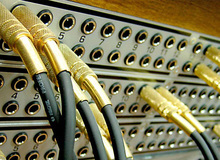 Mogami announces at Summer NAMM that the Neutrik Silent Plug cables are now available in Gold edition. Breton synth manufacturer Touellskouarn is about to release a new cable designed to add white noise to synths that lack this option.